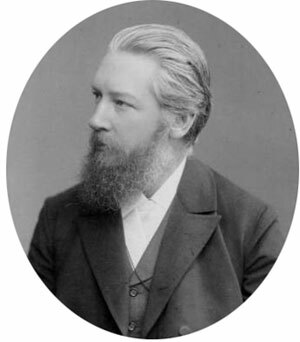 Friedrich Wilhelm Ostwald (1853–1932) was a German chemist, one of the founders of the field of physical chemistry, winner of the Nobel Prize in Chemistry in 1909 for his work on catalysis, chemical equilibria and reaction velocities. In 1910 Ostwald was in Brussels and met Paul Otlet, and they discussed the methods of organization of knowledge. Ostwald had a long-standing interest in the organizational of science, the relationship between science and society, and the effective publication and use of science literature. He was very interested in the efforts of Otlet and his partner LaFontaine to create their Universal Decimal Classification and Universal Bibliographical Repertory, a catalog of all documents of all kinds, including images. Ostwald was so inspired by Otlet's institute, that he decided to establish a similar initiative in Germany. He invited Adolf Saager, a German writer, and Karl Wilhelm Buhrer, a Swiss businessman, and in 1911, using Ostwald's Nobel Prize money, they founded "The Bridge: International Institute for the Organizing of Knowledge Work". The founders believed, that scientific and intellectual work was more the result of the efforts of individuals, who are geographically and otherwise isolated from each other, so bridges are needed to connect them. Ostwald, just like Goldberg and Otlet, believed in the need for creative interaction between science and society. Ostwald and his friends advanced a modernist approach to the management of knowledge by seeking to atomize literature into small components of recorded thoughts, much smaller than books, articles and reports. They believed, that these individual single chinks of knowledge could be arranged and linked in multiple ways, using the expanded decimal classification for the especially important and difficult task of linking each chink with other chunks on the same and related topics. They intended to use as units of recorded knowledge sets of printed cards. A complete sets of all cards would provide a comprehensive, dynamically updated, easily distributed encyclopedia of all recorded knowledge, which in 1912, Ostwald described as a "world brain". Anyone could then assemble, selectively, the set of cards, that would constitute a concise summary of any filed of interest. Ostwald and his friends called their approach to manipulate and rearrange knowledge das Monographprinzip (monographic principle). Their use of this principle was a form of hypertext and the sophisticated structure of links between documents. Of course, prior to the use of digital computers, hypertext was cumbersome and laborious. Unfortunately, after a brief but vigorous existence, the Bridge collapsed when the Ostwald's prize money ran out.